The rocky outcrops, tangled oak woodlands and gurgling Penitencia Creek make it easy to forget Alum Rock is a city park. Hours: 8 a.m. to a half-hour after sunset. Limits: No pets (except for assistance dogs). Parking: $6 inside the park; a limited number of free spots are available at the main entrance, requiring a long walk to the park’s interior. No fees collected on weekdays during non-summer months. Driving directions: Take Interstate 680 to Berryessa exit and go west to Capitol Avenue. Go south for 0.3 miles and turn east on Penitencia Creek Road; follow it for two miles to the park entrance. Created by an act of the Legislature in 1872, the park is tucked into a canyon on San Jose’s eastern edge. Trails to the top of the canyon walls offer impressive views of civilization to the west and the wild hills of the Diablo Range to the east. The hiking isn’t spectacular by Bay Area standards (maps and markers lack mileage estimates, for one thing), but it’ll do if you’re in the neighborhood. Alum Rock has a colorful history. In its early days it was a spa that attracted folks who believed the mineral springs had curative powers. Grottoes built around some of the springs survive to this day – a couple are sulfur springs, which no doubt made people healthier the moment they stepped out of range of those wretched, rotten-egg fumes. Over the years, various trains, tourist traps and amusement parks came and went. 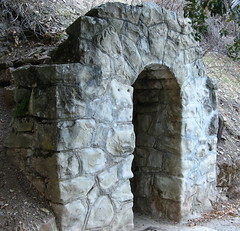 By the 1950s and ’60s, the city parks staff allowed Alum Rock to return to a more natural state. Deer, squirrels and the occasional wild turkey attest to the wisdom of the move. It’s not quite wilderness, but you can tell it’s right next door to the real thing. Standard precautions: Poison oak is prevalent on the narrow, wooded trails. Mountain lions have been seen in the park, so commit the posted warnings to memory. The sulfur-spring grottoes really reek. Easy: The Creek Trail along Penitencia Creek is flat, shaded and quite nice, though sometimes crowded. Hikes of two to three miles are possible. Moderate: The South Rim Trail is the signature Alum Rock hike: four mostly shady miles from the canyon floor, up to the rim – with many excellent overlooks – through oak woodlands and chaparral. Hard: Combine a South Rim hike with a jaunt up the North Rim Trail, and turn on the Todd Quick Trail, which ends a half-mile later at the unshaded Boccardo Trail, a three-mile loop that climbs 1,100 feet in just over a mile to an expansive hilltop overlook. Slap on your sunscreen, and plan on eight to nine miles. I visited this park years ago and came across a small waterfall. Does anyone know where this is?? What trail would I take? The waterfall had been polluted and the place is a little dirty. People had brought in garbage but did not bring it out. To get to the waterfall, you cross the “red metal” bridge. Just before the trail turns steep, and heading away from the stream. This is when you just follow the stream which you will need to do a few rock hopping as there’s no official trail. It’s about 1.5 miles in. Careful not to leave before it gets dark as there’s mountain lions in the park. Better safe than sorry. So does anyone know where the cave is?